This afternoon I saw a treehopper (or some kind of hopper) on the kitchen window screen, so went outside to photograph it. The wind was very blustery (why it was clinging to the screen on the window, I'm sure), hard enough to affect my steadiness, so this isn't quite as crisp as I'd like. But it's a pretty little bug with two little "horns" on the head and that lovely mottled color. We had a spectacular "hopper" on a bush in the schoolyard when I was in 4th and 5th grade: metallic green with a sort of spine on its back that was red on the tip. We used to grab them by the "spine" and they'd release a stream of liquid that (being kids) we were sure was urine. They were all over that particular bush--never saw them elsewhere--and nobody seemed to know what the bush was. It was destroyed to build a gymnasium in that space. At any rate, this little guy was halfway up the kitchen window (small window over the sink) and I was standing at ground level below--it was above my eye line and this was the best picture I could get. HI - so I had to look up treehopper online - wow - so many insects in our world but most of us are completely ignorant of their very existence. Also - are the crayfish edible? Crayfish are indeed edible but ours are a) too small to be worth catching and b) too valuable for their ecological functions on our place to eat...until we have "too many" for the carrying capacity at which time "crawfish etouffe here we come" will occur. I'm very fond of both gumbo and etouffe that includes crayfish/crawfish/crawdads. I wish we had the species I saw once in South Texas in an irrigation lateral canal--that thing was full-on lobster size. I'd never seen anything like it BUT a lobster leftover from a wealthy family's dinner. I thought some idiot had thrown away a lobster...and then a startled it and it moved. If I'd had a net I could have gotten it and taken it home. My new rule for anything I think may be planthopper will be "first take the picture, then prod it to make it fly." The pinned specimens of this moth look NOTHING like this, because they're pinned with the wings spread out. At which point "moth" becomes obvious. 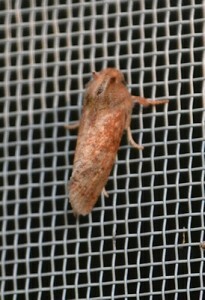 At first sight, I thought this was a moth, but then again, we get a lot of moths which look similar to this on our windows, though they are usually darker brown or grey, rather than this lovely orange-brown colour -- and they will periodically fan out and sit open-winged against the screen. My PC was down for a month; just got back online this week and noticed you haven't posted for a while. I hope all is well. Your first sight was right--it IS a moth. Thanks for your concern. It's been an exceedingly hectic couple of months, and still is--deadlines, too much work, plus new stuff to deal with. I will be fine when the current deadline has been met and I can get some serious sleep and recovery. Take it easy (as much as you can). All the best, and may you have a happy, healthy year ahead.